Integrative Counsellors & Psychotherapists use an array of methods from various models of therapy and try to match them with their clients according to their presenting issues. I am pleased to continue my work as a medico legal consultant and assessor and welcome instructions from the legal profession. These will be treated with the utmost discretion as expected. In my own practice, I use methods from Transactional Analysis (TA), Cognitive Behavioural Therapy (CBT), Person Centred Counselling, Eye movement desensitization reprocessing (EMDR), and Psychodynamic interpretations in order to facillitate change within my clients. The integrative model is a bespoke model in the respect that I can tailor therapy to suit the needs of my clients, hoping to gain early results and therapeutic benefits. STRICTLY NO CALLERS WITHOUT APPOINTMENT TO ANY LOCATION. Anthony Hall-shaw, Dip Couns (Rus), Dip Couns (BACP), PGCert, MBACP (accred. ), MA. Inspirational Psychotherapy & Complete Medico-Legal Assessment & Treatment. 'Worry Guru' is run by Anthony Hall-shaw, offering CONFIDENTIAL, psychotherapy, EMDR, and cognitive behavioural therapy for the advancement of good mental health. This service is available face-to-face or by SKYPE. ANXIETY - Stress is the common cause of most anxiety related conditions and the anxiety can either express itself in the form of Generalised Anxiety Disorder (GAD) or other manifestations such as phobias, obsessive compulsive disorder (OCD), panic attacks, etc. Anxiety can also visit clients in the form of physical ailments, aches & pains, or other disguised woes (sometimes referred to as psychosomatic ailments). Worry Guru, as the name suggests, is well versed in the treatment of anxiety and a combination of counselling (various models) and perhaps antidepressants is often the route forward for patients. Research by the National Institute of Health & Clinical Excellence (N.I.C.E.) shows that a combination of cognitive behavioural therapy (CBT) and antidepressants is the favoured treatment for anxiety & depression. Medications are prescribed by a GP or physician, but if you are seeking a 'talking therapy' to compliment that, then this may be your first step to recovery. As well as ANXIETY, Worry Guru also welcomes enquiries from those suffering with EATING ISSUES, BODY DYSMORPHIC DISORDER, POST TRAUMATIC STRESS DISORDER (PTSD), SOCIAL ANXIETY, PANIC ATTACKS. All counselling and therapy is CONFIDENTIAL unless otherwise agreed. As well as face-to-face sessions, I also offer telephone counselling which many clients prefer for obvious reasons of convenience. A simple booking through the DONATE button within this website will pay for the session and confirmed by sending a text or email to me. Anthony Hall-Shaw is a recognised BUPA Therapy Provider & affiliate therapist, and accredited by British Association for Counselling & Psychotherapy. Also has clinics available at The Priory in Hale. Broken Britain? Is an observation of Britain at the point when capitalism grows weary and apathy is rife. Addressing issues such as, how the exploitation by ruthless advertisers and how our stress levels have suffered as a result. It suggests that political solutions offer little in the way of hope and that answers to our existential angst can often be found within. Anthony King tackles weighty issues in a readable and often humorous style that is accessible to all those who find that they are examining the questions of life and musing upon possible solutions. A self-help book but not in the traditional style it does not prescribe solutions for success but rather, takes the reader on a journey of self-discovery and enlightenment. Exploring the devils that blight our existence and hinder our full potential, King then offers us simple but effective ways of leading a more enhanced life, discovering the process of spiritual growth and becoming a person. Broken Britain? A Karl Marx meets Anthony Robbins meets Deepak Chopra, cross over, takes us through a scintillating journey of life, using the metaphor and visual imagery of a Life Tree and going on to examine culture, life, diet, roots and branches. 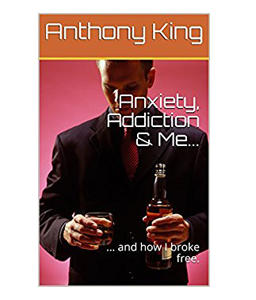 "Anxiety, Addiction & Me" is a semi-biographical account of my struggle with addiction and anxiety and how both these demons are interlinked. One seems to cause the other and this book looks how a lot of us 'self-medicate' difficult emotions by using one form of addiction or another. In my case it was alcohol, which led to a range of other problems in themselves. STRICTLY NO CALLERS WITHOUT APPOINTMENT!